RIM under New CEO Thorsten Heins: So crazy, it might just fail? Now that RIM’s long time co-CEOs Jim Balsillie and Mike Lazaridis have savaged the empire they worked so hard to build, beleaguered business mobility juggernaut’s new chief executive Thorsten Heins is in the spotlight. I’ve thought a lot over the past few years about my interview with Lazaridis, particularly how dismissive he was about touch and certain he was about BlackBerry’s strength with corporate IT. The early reviews of Heins peg him as being a company insider while slagging him for saying “drastic change” isn’t needed. His first press conference didn’t help dispel these sentiments. Looking further back, however, Heins has a track record that’s anything but Lazaridian: He introduced innovative products, bold partnerships and new form factors one after another. The only problem is, they generally were pretty terrible. Heins said he is positioning the SK65 at the top end of Siemens’ range. Doesn’t that clash with the SX1 Symbian-based smart phone, we wondered? No, it seems. The SX1, with is camera and multimedia playback functionality is pitched at a broader audience than the SK65, which the company hopes will attract CIOs keen to equip staff with a executive-styled handset that can connect to enterprise data yet doesn’t offer too much scope for personal usage. The niche market of ultra-luxury phones is an easy target, since they almost always sport inferior hardware, garish design, and excessive premiums for a product that performs worse than its contemporaries in almost every measure. 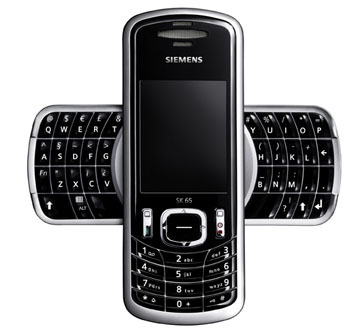 On that note, meet the Porsche Design P´9981 Smartphone from BlackBerry. To it’s credit, it does sport RIM’s latest version of BlackBerry OS, but that’s only because BlackBerry next OS iteration keeps getting pushed back. On that note, what BlackBerry offers with the P´9981 is a mediocre phone on a last-generation platform that retails for $2,000. One pundit wailed that with the Porsche P’9981, RIM Fiddles While Rome is Burning. The truth is that while RIM’s own empire might be crumbling, the state of mobile phones overall has never been stronger, with more innovative players offer stronger offerings for both work and play. This all circles back to the central question for RIM: Where does its future lie? Its past was as an excellent, battery-sipping e-mail centric phone, but RIM’s insistence on beefy processors that will handle 4G likely means an end to its battery sipping days even as its e-mail downtime have made its offering seem (whatever the actual case) a riskier choice than Apple, Android or Microsoft’s tools. RIM’s other traditional pillar has been cooperating closely with IT and telecoms, but Heins has been reiterating that RIM needs to get closer to the “consumer base” to reflect new buying habits, and carriers are reluctant to throw in much energy to promote RIM unless it shows signs of turning things around. Michael Morisy is the editorial director for ITKnowledgeExchange. Followed him on Twitter or reach him at Michael@ITKnowledgeExchange.com.